years before an aggressive exploration of this rich field of chemistry began. The art that followed the pioneering work of Yoshimura, Fuchs, and Lehmann can be classified into two categories: (1) syntheses involving mixed congeners, having either self-terminating residues and/or a combination of sugar amino and a-amino acids, and (2) homo-oligomeric syntheses composed of one sugar amino acid joined in consecutive amido linkages. 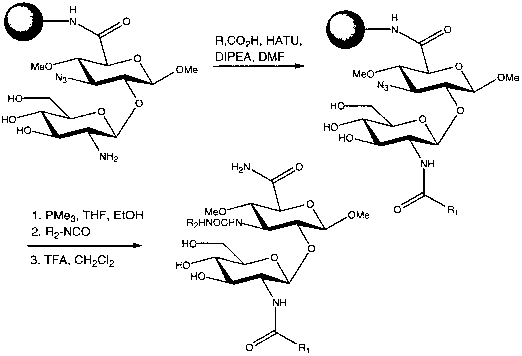 In 1994 Kessler used a sugar amino acid as a dipeptide isostere . He and coworkers proposed that the C-glycoside amine of glucuronic acid would have torsion angles comparable to those of dipeptides composed of glycine and either serine or threonine. They incorporated the sugar amino acid into different peptides and measured their ability to inhibit the release of growth hormone as somatostatin analogs. The results of these experiments suggested that sugar-based peptides hold promise as potent peptidomimetics. Toth and coworkers also prepared sugar amino acid derived peptides in route to modified enkephalins . Two conjugates were prepared and studied. An azido glucuronic acid was immobilized on a trityl resin, and, after reduction, it was further conjugated to five a-amino acids (Leu-Phe-Gly-Gly-Tyr). A second derivative consisted of a sugar amino acid dimer conjugated to the same five a-amino acids. The pharmacology of these compounds was evaluated and the analog containing only one sugar amino acid was shown to be a potent and selective agonist of the S-opioid receptor (Fig. 23). Very recently, amino deoxyglucuronic acids were used in the construction of disaccharide libraries . 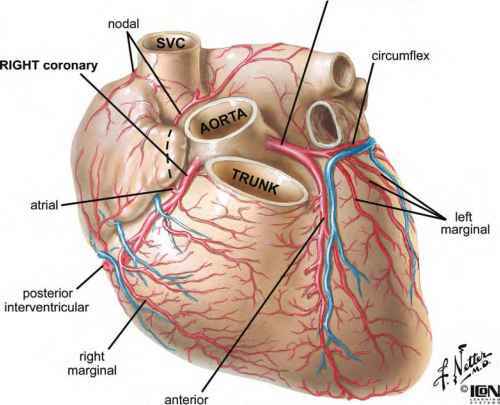 In the report, methyl 3-azido-3-deoxy-4-O-methyl-0-d-glucuronic acid was prepared and glycosidically linked to a protected glucosamine, yielding a disaccharide with both amino and carboxamide functionalities. The azide was subsequently reduced and reacted with several isocyanates, providing libraries of 0-linked disaccharides (Fig. 24). One incentive for making amido-linked sugars as mimics of glycosidically linked disaccharides was the possibility of effecting enzymatic resistance to glyco-sidic bond cleavage. 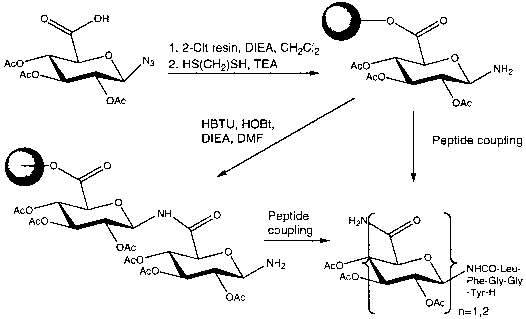 Sabesan nicely illustrated this point in his work on amide-linked disaccharides containing NeuAc . The 2-azido sugar was reduced and subsequently condensed with an activated galacturonic acid to afford only the a-amino-linked disaccharide. This compound was designed to be an isostere of the naturally occurring a-d-NeuAc-(2-6)-0-d-Gal glycosidic linkage (Fig. 25). Gervay and coworkers used two different strategies to further explore the incorporation of NeuAc into mixed sugar amino acid conjugates. In the first report, sialyllactones were prepared and condensed with glycine under thermal conditions . Both five- and six-membered lactones were reacted, anticipating that the ring strain in the 1,4-lactones would promote the reaction. Unfortunately, this was not the case, and only low yields of the desired conjugates were obtained. The six-membered lactones gave improved yields, but, in general, the reactions were not efficient. In later studies, NeuAc was efficiently conjugated to several a-amino acids using BOP and HOBT activation of the acid followed by addition of an a-amino acid . This protocol provided a number of sugar amino acid peptides in nearly quantitative yields (Fig. 26). 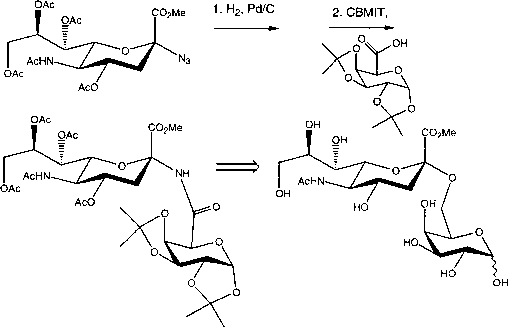 In 1995 Nicolaou and coworkers initiated a renaissance in the construction of sugar amino acid conjugates with their synthesis of carbonucleotoids . Although they did not prepare amide-linked carbohydrates, they did introduce the term ''carbopep-toid'' to designate such materials. Shortly thereafter, a number of papers directed toward the synthesis of carbopeptoids appeared. 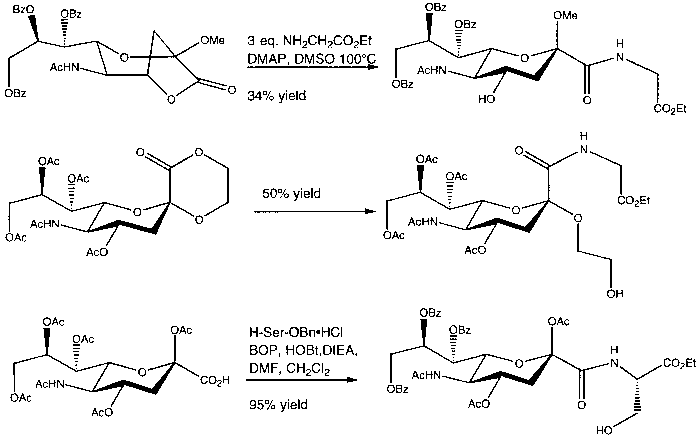 One of the earliest was reported by Wessel et al., who used nor-muramic acid derivatives and condensed them in solution by means of 2-chloro-4,6-dimethoxy-1,3,5-triazine (CDMT) in DMF to construct a tetramer (Fig. 27).